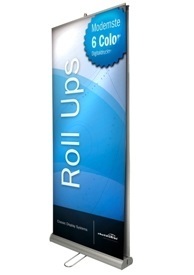 Imagine you are starting a new job with a new company. On your first day, you are shown around an entire office floor that is a maze of cubicles, conference rooms and offices. You are introduced to your new 65 co-workers. By the end of your orientation to your new workplace, your head is spinning and you have no idea whether the man in the cubicle next to yours is William or Joe, nor do you have any idea which door leads to the boardroom versus the bathroom. 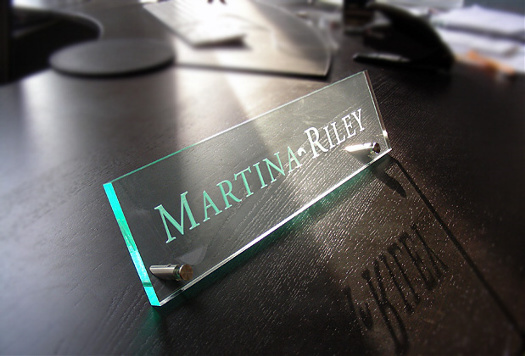 If only your new employer knew the benefits of nameplates – you could focus more on your new job responsibilities and less on navigating the unknown and confusing terrain of your new office. 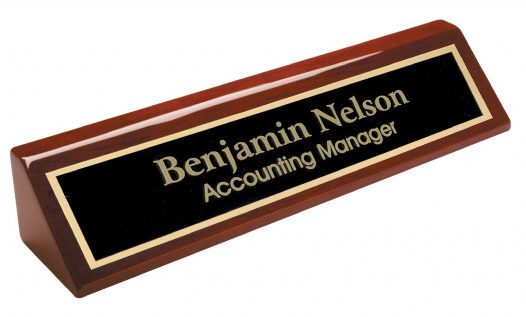 Nameplates go beyond those that sit on someone’s desk, greeting all that enter his or her office. Name plates, when placed by the door to someone’s office, can be an effective tool to create a professional and efficient office space. By placing name plates on the outside of office doors (either affixed directly to the door or immediately to the side of the door, which may make it more easily seen regardless of if the office door is open or closed), it is evident to both employees and visitors where someone’s office is, often saving time associated with trying to find a particular office. The same is true when name plates are affixed to cubicles – not only does that define a person’s personal work place, but it goes a long way to creating an organized office environment. 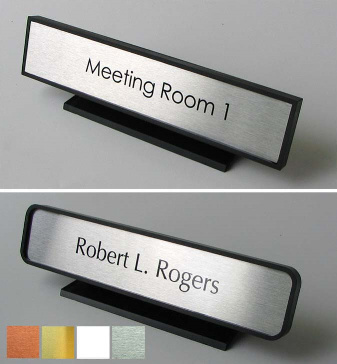 An option offered by name plates for offices or cubicles is that the office number can be reflected on the name plate – either in addition to the name or just the number itself. Much like looking for a house along a residential street, the logical progression of office numbers, when clearly denoted on a nameplate, can assist employees and visitors alike find their way around an office, which promotes promote organization and efficiency. 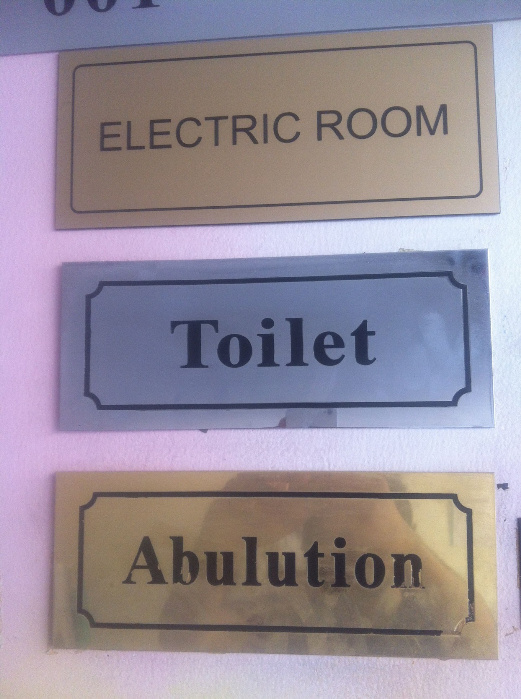 Another benefit of using nameplates is that they can be made such that below the name the status of the room is depicted. For example, a nameplate can include a “Do Not Disturb” message (which can be hidden when not necessary, and is visible by simply sliding the portion of the name plate to one side or the other). Or, the name plate can indicate “Occupied” and “Not Occupied,” helping to avoid those awkward moments when someone barges into a closed door meeting without realizing what is going on beyond those closed doors. 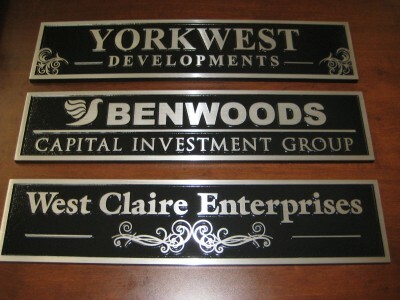 The best part about name plates is that they can be customized – almost any size, color, font or design you need – whatever best meets the needs of your business.